Jamaica Plain, Mass - Regular readers may recall that one of my Top Nine Things to Come Home To is the lilac trees blooming in May. 'Tis the season! Although I do enjoy the two lilacs abloom in my backyard, it's nothing compared to the blaze of 422 plants that are busting out in all shades of purple and white at the Arnold Arboretum. Lilac Sunday at the arboretum is this Sunday, May 9, but the purple pretties are already in full bloom. 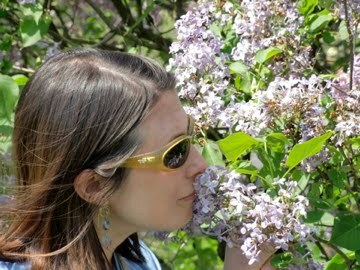 If you want to see (and smell) the 200 different kinds of lilacs, go now - it's peak season! Lilac Sunday will be filled with festivities, including living music and dance, crafts and activities for kids, and tours of the lilacs. Plus, it's the only time you can have a picnic in the park.